Want to take your bass playing to new places? Struggling for ideas on how (or why!) to practice? Needing inspiration to kickstart your creativity? Just starting out and looking for a way to connect learning the bass to the music you love? Want the inside scoop on how to take your solo playing to the next level? At the moment, I’m focussing on teaching via Skype/Google Hangout/any other video tech we can get working! Email me now to book a first session. I’ve got a high def audio set up so you get to hear in good quality, and can advise on the best way to get your bass sound into Skype for the lessons. I’ve been teaching bass since 1992, having taught thousands of students, from total beginners to PhD candidates to globe-hopping rock stars. 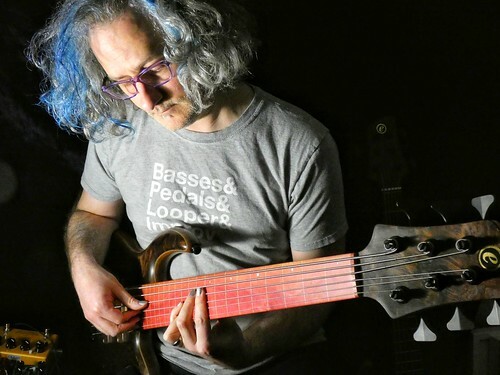 I’ve written tuitional columns for Bassist Magazine and Bass Guitar Magazine – I currently write the Beginning Bass column for BGM – and have given bass, improv, looping and performance masterclasses at universities and colleges all over the world. I currently teach at Kidderminster College and at BIMM Birmingham. Lessons are £40 an hour, or £60 for a two hour lesson. I (very) occasionally teach a series of bass group-classes in Birmingham, called ‘Beyond Bass Camp’ – beyondbasscamp.com has more details as well as a series of blog posts about my thoughts on bass teaching. In the meantime, you might also enjoy the series of blog posts I wrote a while back about my approach to teaching – Part 1, Part 2, Part 3 and Part 4. I’m very interested in having some regular lessons with you. I am quite new to the bass but would like to take my playing up a gear, improve technique, begin sight reading, etc. I live in Bromley so you’re only a short train ride away. Let me know if you could fit me in for an hour next week. how do i contact you to discuss lessons and beyond bass camp events.? I will be in Lodon in may. I would like to have privete class (at evening) of eletric bass. How can i arrange a lesson with you? also what are you using to get your higher octave sound?? is it a whammy ? Hi Steve, we’re Facebook friends. I’m going to be in London (8-17 Jan) visiting the folks for a short while. I’m contemplating a lesson with you. Do you have a phone # that I can call when I get there? I don’t think my folks have internet access, i’m not sure how it works there. Hi, I am interested to know if you have any of your teaching material in a book format to buy, all your columns from Bass Player for example. I find your approach to be exactly what I am after. Hi Huw! The only thing I have out at the moment is a compilation of all my pedal/effects columns for Bass Guitar Mag that is available as part of my Bandcamp subscription at http://stevelawson.bandcamp.com/subscribe – that was a lot of advice about how to use effects, ways of approaching them and thinking about them. I’m actually in the process of compiling my Bass Guitar Mag columns (which are now being re-run in Bass Player) into an eBook, which again will be available via the subscription, so it’s probably worth going and checking out what’s there.